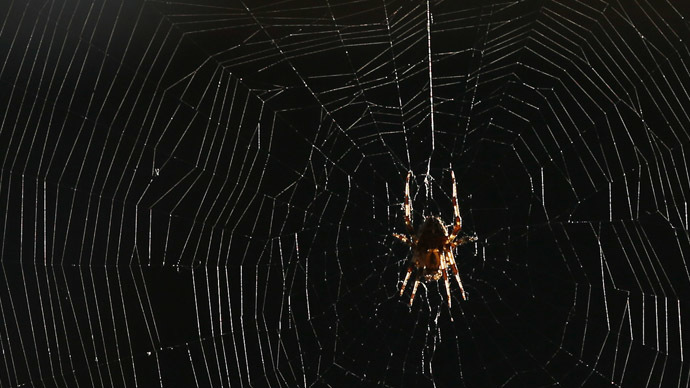 It’s no secret that spider’s silk is incredibly strong, despite its delicate appearance. But the material becomes even tougher when infused with graphene or carbon nanotubes, creating silk which could have superior characteristics. Despite the ease of destroying a pesky cobweb, spider silk is actually one of the strongest natural substances in the world. Meanwhile, graphene – sheets of carbon just one atom thick – is one of the toughest artificial materials. Bearing that knowledge in mind, Professor Nicola Pugno of University of Trento, Italy, decided to combine the two substances. To carry out their experiment, Pugno and his team needed some eight-legged participants. They captured five spiders from the Pholcidae family and sprayed them with a mixture of water and graphene particles ranging from 200 to 300 nanometers wide. They also sprayed another 10 spiders with carbon nanotubes and water, to compare the effects of the two materials. While the strength of some of the silk dropped, much of it became stronger. The spiders sprayed with carbon nanotubes created the toughest silk – around 3.5 times stronger than the best natural silk, spun by the giant riverine orb spider. “This concept could become a way to obtain materials with superior characteristics,” Pugno told The New Scientist. But the exact reason behind the incredibly durable silk remains a mystery. The team initially thought the nanomaterials coated the outside of the strands, but Pugno does not believe this would be enough to account for the increased strength. He believes the spiders may have harvested the material they were coated with to aid with web construction, since the creatures are known to use materials in their immediate vicinity for that very reason. All I want for Christmas is a credible defence against the giant mutant graphene armored spider legions. But not every spider had a chance to create ‘super silk’ – four of the creatures died soon after being sprayed. The research will be published in the journal Materials Science.